Dementia praecox is an unusual term in today's world of psychology. You may read it in older novels or hear an elderly person refer to it. What's interesting is that dementia praecox isn't what most people think of as dementia at all! Instead, it's an entirely different diagnosis with different symptoms and treatments. What Is The Definition Of Dementia Praecox? The term "dementia praecox" was originally used as a psychiatric diagnosis for people who appeared to have dementia before they were old. Also known as "precocious madness," the term indicated that the patient had dementia prematurely. 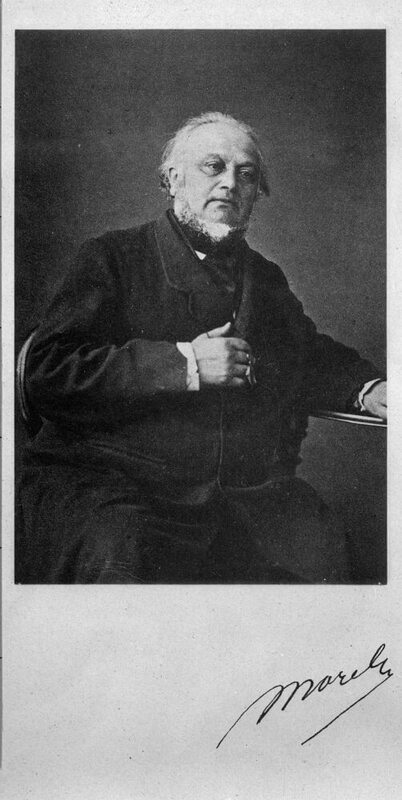 Benedict Augustin Morel first used a French term meaning dementia praecox as early as 1852. Later, psychiatry professor Arnold Pick first used the term "dementia praecox" in 1891 when he was writing a report on a young patient with a psychotic disorder. Later, Emil Kraepelin used the term in the textbook description, and the concept became well-known. In Kraepelin's view, all psychiatric conditions could be classified as either manic-depressive illness or dementia praecox. The first included all mood disorders, while the second included all disorders related to cognitive functioning. Those disorders that fell under the umbrella of dementia praecox included paranoid, catatonic, and hebephrenic psychosis. These forms were included in the Diagnostic and Statistical Manual of Mental Disorders until the DSM-5 was published in 2013. While most may not be familiar with the term dementia praecox, most have likely heard of the newer term that replaced it. 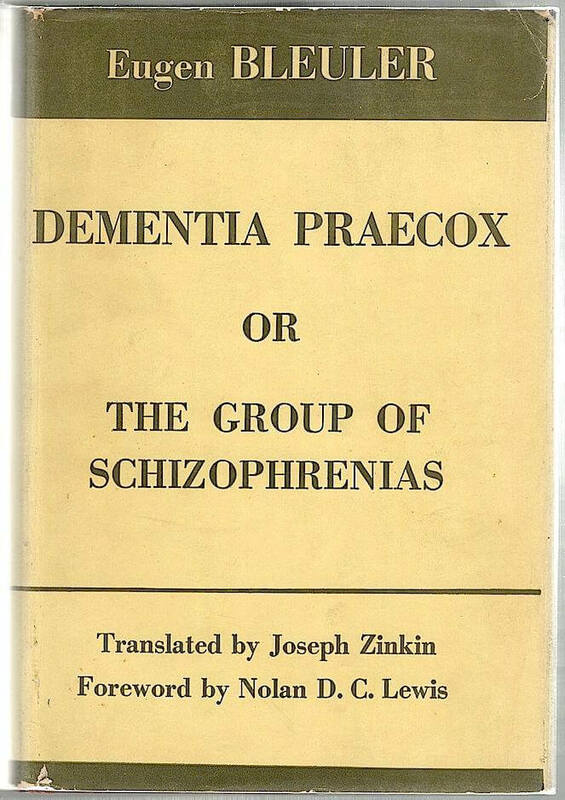 The condition that was once known as dementia praecox is now labeled as schizophrenia, a term that was only suggested as an alternate term for dementia praecox in 1918. The two terms were used interchangeably until 1952 when the first Diagnostic and Statistical Manual was published. Now, the term dementia praecox is rarely if ever used by psychiatrists or even the patients themselves. The term schizophrenia is the accepted term for the disorder that was once known as dementia praecox. No one knows the exact cause of schizophrenia. There doesn't seem to be just one gene responsible for it, although a combination of genetic mutations may make it more likely. Scientists have identified several risk factors that are more common for people who have schizophrenia. Both parents have it - your chance goes up by 40%. You have an identical twin who has it - your chances go up to 50%. You were exposed to a specific viral infection before birth. Your mother was malnourished during her pregnancy with you. You took psychoactive drugs like meth or LSD. How Is Your Brain Different If You Have Schizophrenia? Scientists have found that people who have schizophrenia have differences in their brain structure. The ventricles, empty spaces in the brain, are larger in people with schizophrenia. The medial temporal lobes, which are crucial to memory, are smaller in people with the disease. In one study, the brains of people with schizophrenia and those of patients with mood disorders were examined after their deaths. The brains of the people with schizophrenia were lighter by 6%. The parahippocampal cortices were thinner by 11%. 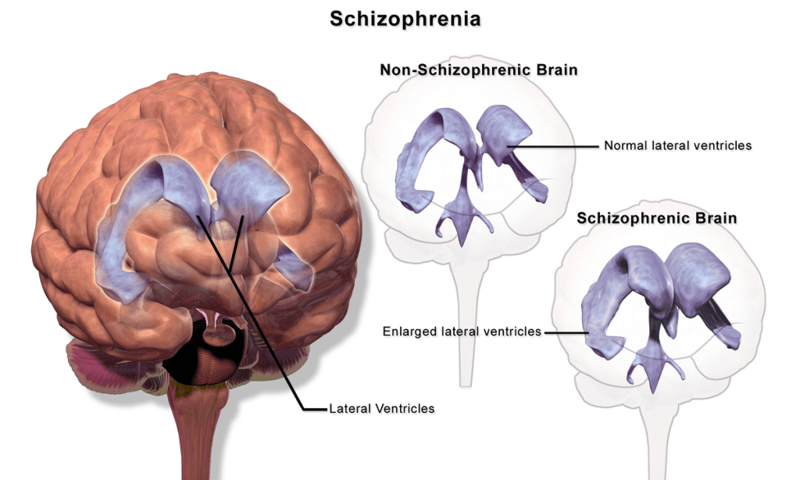 The people with schizophrenia did have larger ventricles. The lateral ventricles were 19% larger, and the temporal horn cross sections were 97% larger. Although some of the brain changes were similar to Alzheimer's changes, they were less severe than in Alzheimer's. Brain chemistry also plays a part. If the neurotransmitters are not in balance, they may cause schizophrenia symptoms. The two primary neurotransmitters involved with schizophrenia are dopamine and glutamine, although others may play a part, too. As the brain develops, there are more chances for the changes associated with schizophrenia to happen. The two critical times for brain development that could affect this outcome may be before birth and during puberty. If a person has risk factors for schizophrenia as well as brain differences, they may have psychotic symptoms during or after puberty. Schizophrenia symptoms usually show up between the ages of 16 and 30, although even young children have been occasionally diagnosed with the disorder. The symptoms of schizophrenia are divided into three main categories. The positive symptoms are those that people with schizophrenia experience that healthy people do not. These are the symptoms related to their inability to discern what is real. They may have hallucinations, which can be visual, auditory, or related to any of the senses. Delusions, or false beliefs, are common for people with schizophrenia. 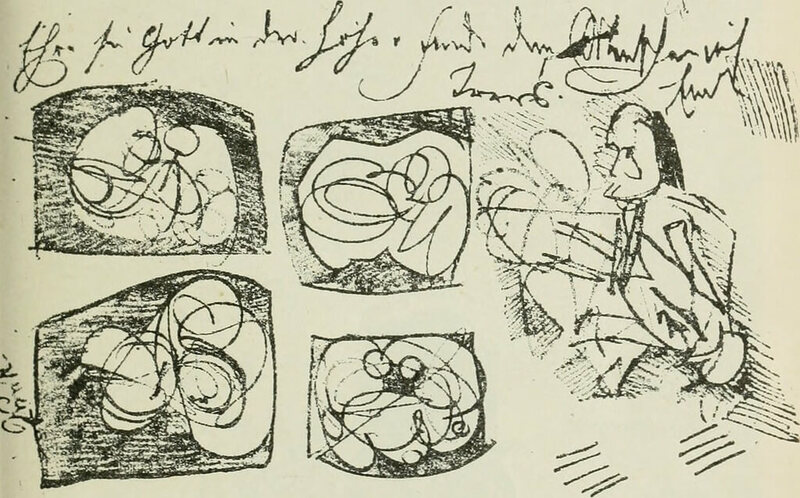 People with schizophrenia may have unusual thought patterns that are known as thought disorders because they are dysfunctional ways of thinking. They may also display agitated physical movements. The negative symptoms of schizophrenia are emotions and behaviors that healthy people have, but people with schizophrenia don't. Reduced facial expressions or changes in tone of voice, called flat affect, are common among people with schizophrenia. They may also be unable to feel pleasure in their daily lives. They may not be capable of beginning or continuing activities. They may speak very little. The cognitive symptoms of schizophrenia are problems with being able to think as effectively as healthy people do. People with schizophrenia may have trouble understanding information and using it to make decisions. They may find it hard to pay attention. It's usually very hard for them to learn something new and then use that information immediately. Before a doctor can diagnose schizophrenia, they need to rule out other causes for the symptoms. They typically give a complete physical examination. They may do tests to rule out other illnesses and a drug screen to rule out substance abuse or alcoholism. A psychiatrist evaluates the patient's mental status. The psychiatrist asks the patient questions about their symptoms. They get information, either from the patient or their family members, about their family history and personal experiences. They observe the patient's appearance, noticing how they respond to questions. They watch for signs that the person may be violent or suicidal. The doctor will compare all this information with the DSM-5 to see if the symptoms match the criteria for a diagnosis of schizophrenia. If so, the doctor will typically explain his diagnosis and create a treatment plan for the patient. There is no cure for schizophrenia at this point. However, several treatments can be very effective in managing and diminishing the symptoms of the disorder. A psychiatrist is usually in charge of the treatment, but other professionals may be involved, too, including a psychologist, a psychiatric nurse, a social worker, and a case manager. The medications used most often for people with schizophrenia are antipsychotics. These medications influence the action of the neurotransmitter dopamine. This helps relieve the symptoms. Along with antipsychotics for positive symptoms of schizophrenia, psychiatrists often prescribe other medications to help with other facets of the disorder. These include antidepressants and anti-anxiety medications. The most important thing to remember if you or a loved one has schizophrenia is that you need to talk to your psychiatrist before changing the way you take your medication. Stopping suddenly can be both mentally and physically risky. You can ask your doctor what to do if you miss a dose, but it's best if you do everything you can to take your medications consistently and as directed. If your loved one is taking medications for schizophrenia, be supportive. That doesn't mean nagging or making them feel bad because they have to take such medications. Instead, what they need is a caring supporter who encourages them to follow their treatment plan so that they can live the best life possible. Individual psychotherapy can help people with schizophrenia work on changing their dysfunctional thought patterns. They can learn to cope with stress. The therapist can help them learn to recognize when they are headed for relapse and come up with a plan to avoid it or minimize its effects. People with schizophrenia may need social skills training to improve their communications and social skills. They may need help engaging in daily activities. If they can work, they may need help from vocational rehabilitation program or a sheltered workshop. Family therapy can help the families of people with schizophrenia. In this type of therapy, families get information about schizophrenia and learn ways to cope with the disorder as a family and as individuals. If you or a loved one is concerned about symptoms that appear similar to schizophrenia, you can talk to a counselor for help in deciding what to do next. Licensed counselors are available at BetterHelp.com to help you understand what is involved with this diagnosis, deal with it, help your loved one manage it, or cope with other mental health challenges. When symptoms of schizophrenia are at their worst, the patient may need to be hospitalized. This is sometimes important to make sure they're safe, and their needs are being met. 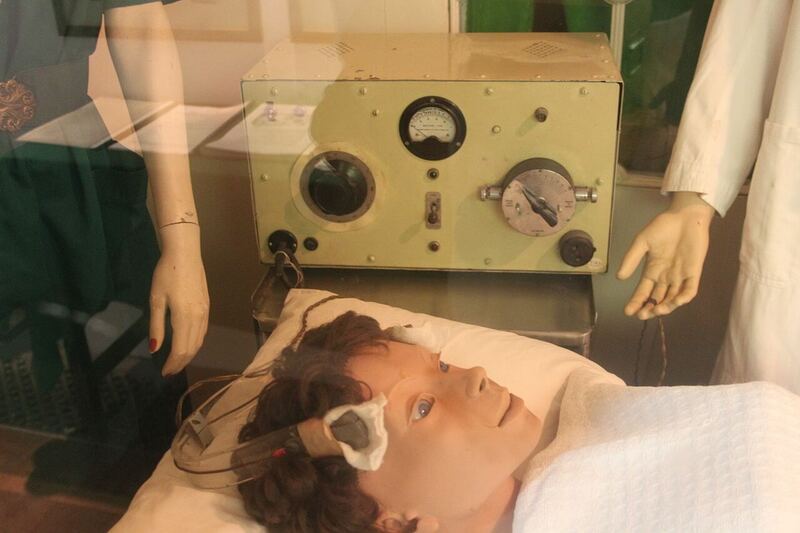 For adults who aren't helped by medications, electroconvulsive therapy (ECT) may be an option. ECT is especially helpful for people with schizophrenia and depression together. In the early 1900s, when Kraepelin first used the term dementia praecox, he believed that the disease was a severe, rapidly-progressing disease from which no one could recover. He softened on that view over time, but the fact remains that people with the condition then known as dementia praecox rarely recover. However, there is still hope. The hope is not that the disease will disappear. Instead, it's that the symptoms of the disease will be diminished enough that the person with schizophrenia can live a decent life, functioning well in their daily activities, working as they can, and finding enjoyment often.